This character-driven novel is an emotionally satisfying read that shows it’s never too late for reinvention. 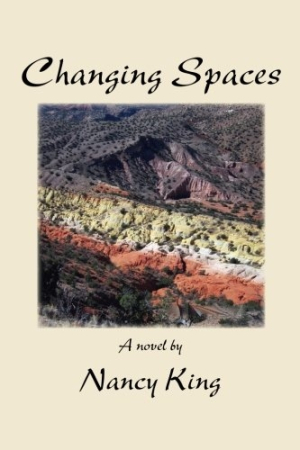 With a cast of characters as colorful and inspiring as the setting, Changing Spaces, by Nancy King, is a heartwarming tale of a woman’s search to find a sense of self and independence late in life. Laura Feldman is comfortable in her life. A respected grant writer by trade, and a loving wife to her husband for more than forty years, she has become accustomed to her routines. When her husband, Zach, unexpectedly asks for a divorce, she is dazed and broken. In her love for Zach, she lost herself, her dreams of children, and a career pushed to the wayside for his own career. In an uncharacteristically impulsive moment, Laura chooses to start over in Santa Fe, a place where she has never been and, more importantly, knows no one. The bold and hardworking women of a bed-and-breakfast immediately recognize Laura’s look of desperation and take her in. With the help of the astonishing beauty of the Santa Fe desert and mountains, as well as the free-spirited friends she meets, she learns how to love herself and find hope and meaning, even at sixty years old. The book’s greatest success is the realistic and inspirational portrayal of the friendships between Laura and the women who aid her in Santa Fe—Bounti, Lisa, and Willi. Their attempts to teach Laura to “take [her] full space”—both literally by having larger physical mannerisms and movements, and figuratively through her confidence and way of speaking—are entertaining and intriguing. King is refreshingly thorough and purposeful with her characterizations. Bounti, in particular, is a fascinating foil to Laura in appearance, background, and attitude, and a thoughtfully well-rounded character in her own right. With her large physical presence, her bright, sweeping skirts, and her fiercely honest, yet warm, demeanor, Bounti is a captivating woman whose influence on the meek-mannered wallflower Laura is simultaneously hilarious and uplifting. The unique supporting characters that help Laura transform also enhance the theme of the importance of unapologetically being oneself and reinforce the idea, in a humorously original way, that independence doesn’t mean one can’t lean on others for help. While Laura and Zach’s dissolving marriage is potently heartbreaking, the parallel narrative of Zach’s angry life alone, which runs through the entire novel, could be more concisely shown as Laura learns of it rather than telling it through his point of view. While Laura might be unsure about his ability to change his domineering and abusive behavior, it is clear from the outset of the novel that he will not. Thus, his story line feels superfluous. This character-driven novel will entertain and inspire those looking for an emotionally satisfying read that shows it’s never too late for reinvention.